Central European cities like Vienna literally re-awaken in the spring after many long and grey winter months. The streets fill with people and cyclists and the numerous museum and gallery goers are not solely confined to the interior of these spaces, but gather in front and outside of them, thereby reviving the cityscape. Vienna’s museums house exquisite historical collections and fascinating treasures, many of which are proof of an early global interest and outreach through trade, diplomacy, far-reaching family ties, and war. One such collection is the largest surviving 16th century Hamzanama manuscript at the Museum of Applied Arts (MAK), where it has been kept (not on display) since its acquisition in 1873 at the Vienna World Fair. Not far from the MAK in Vienna’s central district lies Porgy&Bess, which has been rated one of the ten best jazz clubs in Europe by the Guardian (2nd February, 2016). Directly next to the entrance to the famous club is an exhibition space dedicated to showcasing art with a direct view and access from pedestrian streets, bars and shops. Traversing the Wien River and legendary Naschmarkt—a 1.5 kilometer-long market dating back to the 16th century—the 5th district reveals itself to be laid-back, with cobble stoned streets and small houses. Here, the independent art space ‘hinterland galerie’ is known for its promotion of intercultural and interdisciplinary projects, mainly working with artists from the Middle East and, in particular, from Iran. Within the framework of a cultural exchange programme, the current Austrian ambassador to Pakistan, Brigitte Blaha, has invited Aisha Khalid to curate an exhibition of works by artists from Pakistan at Porgy&Bess and ‘hinterland galerie’ in Vienna. Aisha Khalid took on this challenge and created a sensitive curatorial programme that addresses pressing issues such as the conditions and contradictions of particular constellations of ideas and forces that coalesce when the local and global come together. For Porgy&Bess she invited Ali Kazim to create an installation. 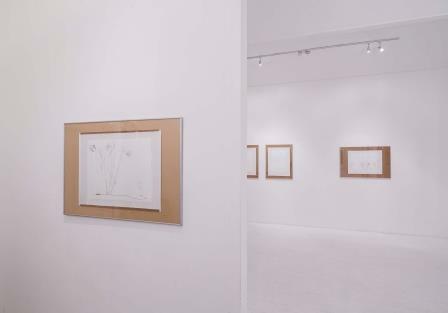 By painting the gallery walls in a light grey tone, the artist created a contemplative environment that serves as a backdrop for his painting, drawings, and sculptural works. 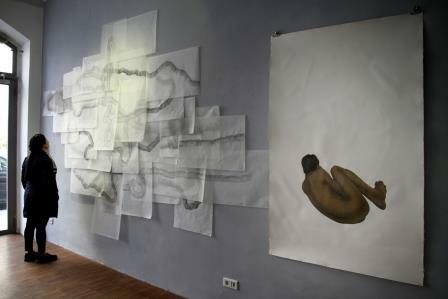 A large watercolour pigment painting of a curled, naked, male body takes up one third of the main wall. Next to it and connected with the painting are drawings on tissue paper, which are layered and hang loosely down the wall. The naked figure whose face is twisted and buried in his hands shows us his rolled-up back. The position of the body on the paper as well as its posture is suggestive of a fetus – a figure at once protected and vulnerable to all sorts of influences. The drawings on the cascading tissue paper, layered in a similar way to the many washes and layers of colour in his painting, resonate physically and metaphorically with each other: first, between the fragility of the tissue paper and the fragility of the naked human body, and second, between the finely and detailed drawn lines on tissue paper—reminiscent of an enlarged intestine or an umbilical cord—and the layers of colour and pigments forming the texture of the painting. The ceramic pieces “Fallen Objects” displayed in a wooden glass vitrine on yet another set of drawings on tissue paper contribute to the overall composition of this installation in terms of weight, fragility, and the lifelines drawn on the surface of the objects. The inherent multiplicity of Ali Kazim’s installation, as well as the intimacy, delicacy, and attention to technicality, carries on in the artist’s work selected for the second part of the exhibition taking place at ‘hinterland galerie’. Here, six artists responded to the curator’s concept of addressing private and local spaces and concerns while simultaneously being part of a global art world. 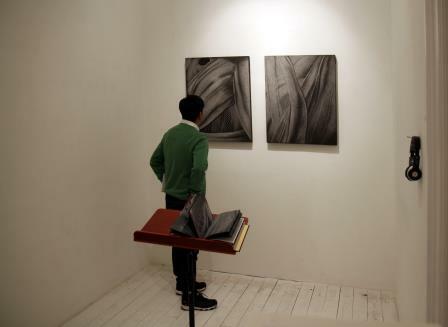 Adeel uz Zafar’s mixed media installation includes two engraved drawings on vinyl, a book on a lectern, as well as sound. As opposed to his previous work, this is clearly a step towards abstraction, in which he probes the possibilities of exploring the social and political conditions of material culture by pushing the limits of engraving, drawing, text and sound. The pages of the book displayed on the book rest contain no words. Rather, the imagery seems to spring from the two engraved vinyl drawings. The sound issuing from the headphones was recorded during the creation of the installation: the sounds of scratching, etching and abrading with needle-thin precision onto a vinyl surface. This work is both a reflection on the parameters and conventions governing the presentation of art in general and a reflection on the margins of language and representation that orchestrate stories and viewers. Language and the written word—whether readable or not—form an integral part of Aisha Abid Hussain’s practice. Her work is inspired by found documents, personal archives, and poetic experiences. 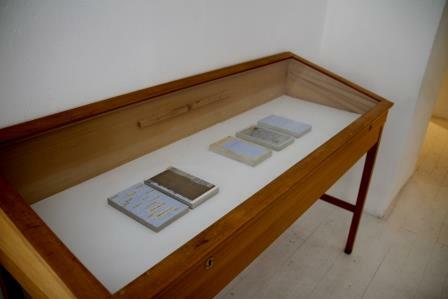 She is interested in stories that are kept secret and in their archival character the five “books” on display in Vienna, inscribed with permanent ink and collage on top of multiple layers of paper glued together with an organic binder, a working surface borrowed from the miniature tradition, become a kind of resistance to official texts. This displaces the gaze, which is usually directed at the politics of the region, towards the aesthetics of her work, which are both visible and absent at the same time. Syed Hammadullah Shah Gillani’s gauches on wasli are characterized by staged forms—humans forms, perhaps—in such a way that they become signs and symbols on the surface, reminiscent of words. Rubaba Haider builds her gouaches on wasli paper with lines that come to fill the space with an effect of muslin or rough khadi mesh. The material effect thus reveals both an irregularity and a solidity that reinforce a meditative method of working. Rehana Mangi’s detailed works using hair investigate ideas of identity in combination with metaphors for the body’s vulnerabilities and desires. Noor Ali Chagani’s miniature brick walls can be seen as the three-dimensional manifestation of the framework of a traditional miniature painting, but at the same time they echo the language of minimalism or Op Art. The works represented in the exhibition very much reflect exquisite technical abilities and a certain rigor of application which can be associated with the practice of miniature painting. At the same time, they respond to the curator’s statement by deploying their position in their respective locale to establish the subjective position of an artist addressing private and local spaces and concerns while participating in the global art world. The question of specificity of location is pertinent. Thus, Aisha Khalid appears to be responding to Lévi-Strauss, for whom individual forms were local, while the laws of linguistics—the governing thoughts, patterns, and processes of the mind, as well as structured human desires, exchanges, and societies—were global. Personal/Universal. A group exhibition from Pakistan, curated by Aisha Khalid. hinterland galerie, Vienna, Austria. April 5-May 7, 2016.